Please release the text that is inside the Trans-Pacific Partnership. I believe that if signed, the TPPA will threaten the sovereignty of New Zealand, and all the negotiations have been secret. This international agreement could curb New Zealanders' internet freedom and intellectual property rights among other things. 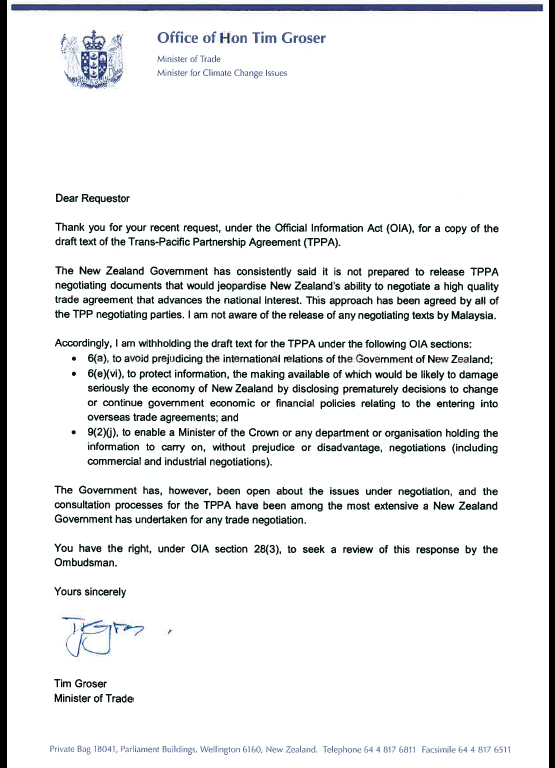 But New Zealand still doesn't know everything that TPPA contains, and we want to know what it means for us if our government were to sign it. That's a screenshot of exactly what you sent to me under the guise of writing a real explanation under the OIA. But that's not what you did. All you told me is what I and millions of other people already know: You don't want to tell us what's in the TPPA. One would think that when asking for information about something as important as TPPA via a service that legally requires you to spill the beans on whatever earth-shattering secrets you're hiding would actually get a real response, and not just more legal jargon explaining how telling us what's inside the TPP might "damage seriously the economy of New Zealand" or "prejudice the international relations". I'm tired of the secrecy. When something like this is so important and not being discussed with the people it's going to affect, that's not democracy. That's Fascism. Please refrain from sending replies that are abusive and opinion based from this site. Not only is it inappropriate to respond to a legitimate refusal by abusing the Minister but it is not what this site is designed for. Your actions bring shame on the thousands of NZers who use this site within the rules and with dignity.